A garden with collection of plants from mainly southern hemisphere such as South Africa, Mexico, Canary Isles and Australia with ships’ figurehead museum. One of the world’s most interesting botanical experiments. 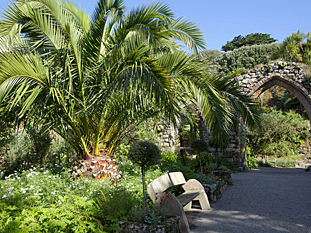 Augustus Smith created Tresco Abbey Gardens in 1834 around the remains of the 12th Century St Nicholas Priory. They are one of the most remarkable sub-tropical gardens in the world. Here is contained a unique collection of plants, many of which are too tender for outdoor cultivation on the British mainland. 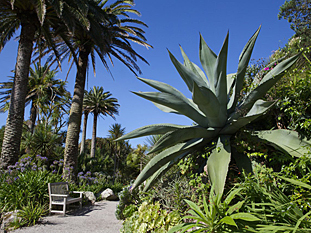 Tresco Abbey Gardens flourish in the warm Gulf Stream climate and are regarded by botanists as one of the most interesting and varied botanical experiments in the world. 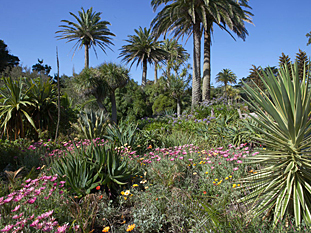 Parts of the seventeen-acre gardens – which were started in 1834 – carry names which reflect the origin of the plants grown there: ‘Higher and Lower Australia’, ‘Mexico’ and ‘South Africa Cliff’ are typical. There is a strong Mediterranean and South American flavour as well. Among the more spectacular sights is the tallest Norfolk Island pine in Britain in the Long Walk, bananas growing outside in the Old Abbey ruins and a very rare and prized Cordyline Australis nearby in the Pebble Garden. Tall palms from Chile and the Canary Islands jostle for space with the Maori Looking-Glass Tree, Table Mountain Silver Trees, brilliant Mesems and the spectacular New Zealand Christmas Tree. A walk through Tresco Abbey Gardens will be the highlight of your visit to the island, offering hours of pleasure in one of the marvels of the gardening world. Fly on Skybus from Land’s End and Newquay all year round and from Exeter in the summer months. All flights land on the island of St Mary’s. If you have booked accommodation on Tresco, you will be met at the airport and accompanied on the short final leg of your journey. We will also take care of your luggage. Sail on the Scillonian III passenger ferry from Penzance to St Mary’s, where there is a short onward boat ride to Tresco.